For a long time I have wondered about Stan Grant and his recent profile in respect of Indigenous issues and matters of race. My feeling was (and it appears that of a number of friends of mine) that this was somehow a recent phenomenon that we were witnessing. How wrong we were. I have just had the good fortune to read his book “Talking to my country”. The book is subtitled “The book that every Australian should read”. I disagree with that subtitle. I believe that this is a book that all Australians MUST read. At the very least this book needs to be part of the curriculum of every school in Australia. Being a person who came here when I was 15 and having done only my last two years of high school education here before embarking on my Bachelors and Masters degrees I did not learn anything of Aboriginal history in Australia. I can certainly tell you more about the Mughal Empire in India than I can of my adopted country’s heritage. So for me, this was essential education material. I learnt a considerable amount from Mr Grant. Stan Grant has a fantastic turn of phrase. His use of language is among the best I have ever read. It is evocative and emotionally heart rending to read of his hurt and anger at what we have done to his people. Let me give you an example early in the book. He writes of growing up around places named “Poison Waterholes Creek” and “Murdering Island”. Places named thus to describe what it is that we did to Aboriginal people there. “Their deaths linger here. I can feel it whenever I am home. It is not hard to picture them: bodies bent and twisted; mouths open; the air filled with the stench of vomit as they coughed up the poison. Flies hover over the decomposing flesh. Soon the birds will come to peck at the carcasses. There is no one to bury them. Here they will stay until they sink into the earth”. It is hard to read that without shedding a tear or two. I have no problems in admitting that I did so at various parts of Grant’s book. His turn of phrase allows him to transport the reader to the position of bystander, watching this unfolding massacre of a whole culture by the invading white man. He speaks eloquently of what it means to be a Wiradjuri man. He is a man of the “place” and he is acutely aware of his roots in the country. I hear talkback hosts often calling on Aboriginal Australians to forget the past atrocities and to move on from that time. We hear people say that they did not perpetrate these acts therefore they should not be held responsible. As Grant says “We are told now to stop playing the victim; these people were never victims”. This would almost be achievable but for the fact that Aboriginal Australians, like Grant’s grandfather, enlisted to assist the war effort of the white man in a country that did not even recognise his humanity let alone his citizenship. So having sacrificed their time and their efforts they came home to a country that even today does not provide a standard of health care, lifespan, mental health and other issues even comparable to that of the white man. There are some very personal recollections of his own mental health challenges and the depression that he went through. He talks about those issues in a very open manner and is a person who today is very comfortable in his skin, both from a cultural perspective and also from a deeply and intensely personal perspective. This is to be commended. There are so many parts of his book that resonated with me. His anecdote of playing Led Zeppelin’s “Stairway to Heaven” on a rusty Russian guitar and connecting with and being accompanied by an Afghan Rubab (a type of lute) player in the playing of this piece is descriptive of communication that happens between two human beings that do not even have a common language. He discusses in some detail the Adam Goodes incident. I have written a few pieces about that incident and every time I have, it has led to a torrent of abuse from die hard football fans. Stan Grant addresses every one of the justifications proffered by these people. When you read about the person, Adam Goodes, you can’t help but be touched by the impact of the mindless treatment of a very significant and gentle human being. The hurt that was caused to him was deep and led to his retirement from the game. And that is part of the oppression that Grant points to that continues to this day. There is much more from his book that I had tagged to reproduce in this article. But that would defeat the purpose. This is a book that, as I said earlier, every Australian MUST read. It is a deeply personal telling of a story of a man and his history. At the same time it is also the telling of the history of this nation. It is a history that those of us who are migrants to this country, have never learnt or have chosen deliberately not to acknowledge. Our reasons for this are manifold. We must, as Australians, acknowledge this bloody and horrific history. Towards the end of the book, Grant reproduces a piece that he wrote following the Adam Goodes incidents in 2015. Those notes are essential reading because they contextualise the incident within the framework of Aboriginal oppression that is still evident 200 or more years after the invasion by the white man. Despite my many years of advocacy for the policy of multiculturalism in this country, I have always indicated that I will not advocate for that policy if it is going to further marginalise the Aboriginal community. That is the principle by which I have abided steadfastly. I would urge all other community leaders to do the same. 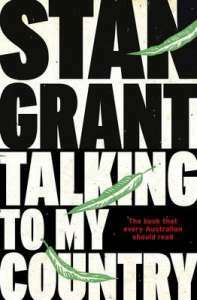 Stan Grant’s excellent and incredibly easily readable book titled “Talking to my country” is published by Harper Collins and is available at a RRP of $29.95. Very well presented, Suresh – a story that definitely merits telling. Time for respective governments to address and correct, now. Very well said, Suresh. Thank you – will definitely buy!